Click the link below & check it out lova’s! 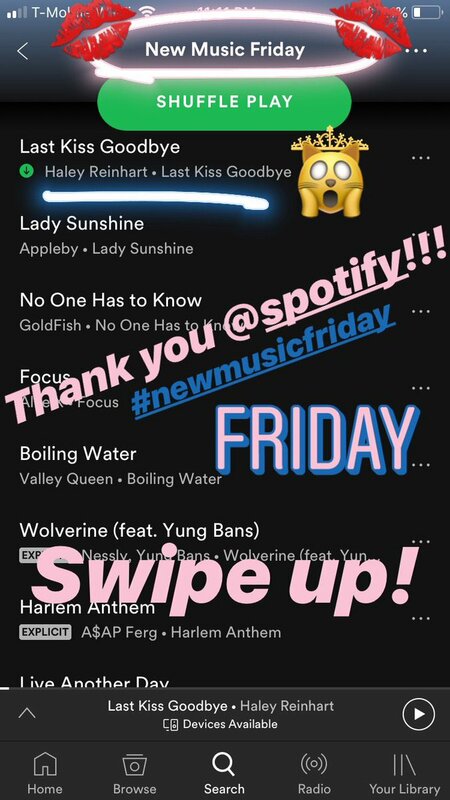 Haley's team deserves credit, but it probably helped that CHFIL topped the Spotify Viral Top 50 back when it was released. Quote: Every week, Spotify updates their "New Music Friday" playlist, featuring 50 of the freshest new tracks hitting the service that week. a good chance people will recall the name of the song. pull themselves away and continues to kiss their love. I think strategy wise, releasing LKG instead of something more produced, makes sense because it echoes some of the qualities of CHFIL where Haley's textured vocals are the hightlight. Better chance that when people hear LKG, they'll make the connection to CHFIL and think "Hey, I like her....."
- @HaleyReinhart got over 27,000 plays on her new song “Last Kiss Goodbye” today on Spotify. More than her last few singles on their first day!! (05-31-2018, 01:15 PM)rmd1064 Wrote: The first few times I heard "Let's Start", I thought...well, OK, I guess. Now I love that song, one of my favorites of hers. Let's give LKG some time to marinate. I do love the bossa nova beat. I like it too .. Yeah it took me a few listens for Let's Start to really sink in but it did. I really like the Better songs but I really don't play the album much. ... although that does seem to be a chicken and the egg thing because it's those rare performers that can keep pulling them out and having people like them that are the legends... and then it stops. One thing I do know is that . . I still really do think there is going to be more placement for lots of these songs in the future .... Show me your moves never has been one I listened to but it's entertained a heck of a lot of people watching the ads and made Haley some money I'm sure. So even though there are some 'duds' on my channel, if they're close to being 'good', I post them, because, again, I can't predict what people will like. As far as Haley's original's potential, I find myself having to explain to people that don't pay attention like we do, I really do believe that a song's advertising sync potential is a factor for which song Haley produces. SMYM is THE example of that. IIRC the song was met with less than enthusiasm because most wanted something Jazzy, something classical...they didn't expect SMYM, yet, Ole was able to turn that around and make money for themselves and Haley. It took me a bit to find it on Amazon - they mustn't have had it indexed right initially and they have at least on other song for sale with the exact same title. A bit lame though for Amazon as they're master marketers and know they've sold me other Haley Reinhart albums and I've reviewed them etc and .. you know they usually are 3 steps in front of what they can guess I want. Amazon has it tagged "Jazz" , only Jazz not both Jazz and pop. It was #2 in new Jazz releases.